The Pallottine Family came to birth in 1835 when St. Vincent Pallotti was inspired on January 9 to create the Union of Catholic Apostolate to promote the involvement of all the baptized in the Mission of Christ. St Vincent’s spirituality was especially marked by his deep desire to revive faith to rekindle charity as he worked with rich and poor alike. As a child he gave his own food and clothing away to those who saw the need. Throughout his life his constant concern was to relieve the sufferings of those around him. He died shortly after giving his coat to someone else who was cold. He taught that every human being is a mirror of God, worthy of reverence and love. He also taught that the role of each Christian is to be a sacrament of Christ’s presence in the world. He was a warm friend and a compassionate spiritual director. 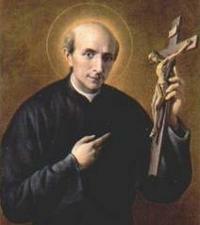 He died on the 22nd of January 1850, at the center of his new community, the church of San Salvatore in Onda in Rome. Vincent was beatified by Pius XII on the 22nd January 1950 and was canonized on the 20 January 1963 by Pope John XXIII who referred to him as a “loving saint who displayed such remarkable love and is one of the outstanding figures in the field of apostolic activity”. $40.00 per person, includes family-style dinner, open bar. Music by DJ Jim Zang of Bass Note Productions. Plus door prizes, grand raffles and more! For tickets, contact the Pallottine Mission House, 424 Orange St., Wyandotte. 734-285-2966 or email at pallottine@wyan.org. 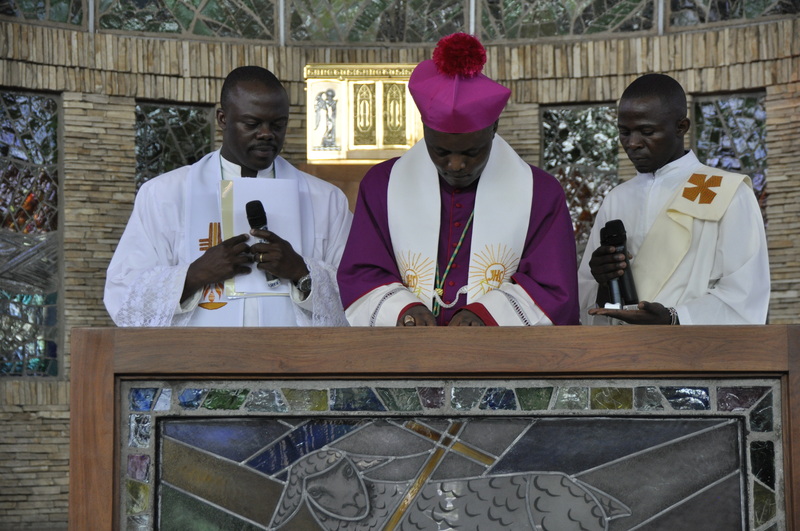 Jan. 26, 2016 – New Church of St. Vincent Pallotti in Esso, Arusha, Tanzania. Friday January 22, the feast day of St. Vincent Pallotti, was a very special day for the parish community at Esso and for the Pallottines in East Africa. That day marked a culmination of a vision and years of hard work, effort and collaboration of countless persons in the parish of St. Vincent Pallotti. At 4pm the auxiliary Bishop of the Archdiocese of Arusha, Monsignor Prosper Lyimo, placed the relic of St. Vincent Pallotti into the newly constructed main altar and sealed it, this ceremony took place as part of a ceremony of sung Evening Prayer which was attended by those of the parish community who could be present and the Pallottines and the Sisters of the Congregation Daughters of the Sacred Heart. The following morning, Saturday January 23rd , dawned bright and sunny and the parish community came out in strength to participate in the solemn consecration of the parish church and its official opening. Monsignor Lyimo was due to officiate at this event but had succumbed to a bad dose of laryngitis and the Archbishop of Arusha, Monsignor Josaphat Lebulu, came in his stead. The parish community attended in their thousands, all brightly decked out in white and yellow tee-shirts specially commissioned for the occasion. The ceremony was reverent, joyful and celebratory as befitted an 11 year history in the parish. It was a celebration of the vibrancy of the faith of the Catholics in Esso, a celebration of the commitment of the Pallottines who served there and facilitated the development, it was also a celebration of the many volunteers and contributors who in one way or another took part in the building up of this impressive community life and faith centre. The procession halted at the door of the church, Archbishop Lebulu blessed the doors and the pillars, the ribbon was cut and the door formally opened. He then anointed the altar with oil, blessed the baptismal font, blessed the church walls and the congregation gathered for the event. Suffice it to say that the ceremony started at 10am and concluded at 2.15pm; the four hour Eucharistic celebration was filled with song, dance, prayer, readings and reflections. The Pallottines were first invited to minister to the Catholics in this disadvantaged area of the city of Arusha in 2004. Fr. Noel O’Connor was the first Pallottine to work here, he was joined by Fr. Michael O’Sullivan and while Noel was also Novice Master the novitiate was also held here, Frs. Paul Makita, Boniface Muro and Martin Mtai were novices then, along with Paul O’Callaghan from Dublin. Fr. Andrew Kayhumbya joined Fr. Michael and they worked together for a number of years. Fr. Reginald Kimathi is the current parish priest and his assistant is the recently ordained Fr. Simon Sserufambi . 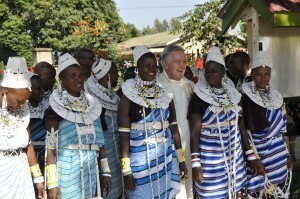 The Irish Province of the Pallottines has served in Tanzania since 1940 and in Kenya since 1986. Most of our members in East Africa are Tanzanian and Kenyan born, with some of our seminarians coming from Uganda. Click on the video to hear from Fr. Michael O’Sullivan, S.C.A. Click on the link below to see what has been done so far.